It's going to be a very slow, very milked, very drawn out process - so hold on tight. 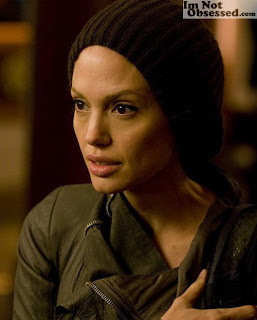 We've already seen two pictures of Angelina Jolie on the set of Salt. Today, a third one has just released. The story centers on Evelyn Salt, a CIA officer who is fingered as a Russian sleeper spy. She eludes capture by superiors who are convinced she is out to assassinate the president. While trying to reunite with her family, she struggles to prove someone else is the traitor. While I'll take Angelina in any way that she's thrown at me, I'm ready for the action shots! Where's Angie kicking some rear? Those are the pictures I need released.